Hello. It's no secret that I'm a big fan of the 9mm Hi Power...but I enjoy shooting other handguns as well. The 1911 type handgun in .45 is a constant temptation for range trips, but so are several revolvers and other autopistols. Lately, I've been "working" with "strange" handguns for me: Glocks, SIG-Sauers (both conventional DA/SA and the splendid DAK versions), as well as considerable DA work with both S&W and Ruger revolvers. Today, I decided to go to the range just for myself and shoot just what I wanted rather than "testing", learning newer designs, and reviewing old skills that I'd neglected. In short, I wanted to have fun, something that is always at or near the top of my list of things that simply must be done. No. 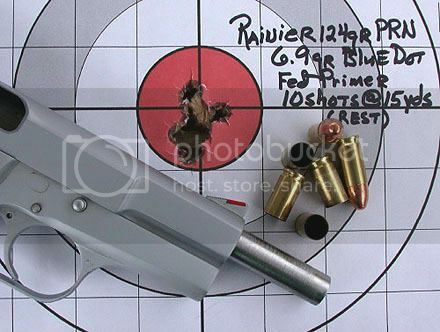 1 started life as a '71 classic 9mm blued Hi Power with adjustable sights. It was shot lots and introduced me to "Hi Power hammer bite" and after I literally wore the blue off of the front strap from use, I had some custom work done. The "coke can" adjustable rear sight was replaced with S&W K-frame revolver sights and an appropriate serrated front sight w/red insert. The gunsmith (Lou Williamson) also built up the small thumb safety into a slightly extended one, bobbed the hammer spur and did a trigger job on the gun...which already had a decent trigger out of the zipper bag it came in. He fitted a then-new Barsto barrel. It is an early version and is 5" long rather than the usual 4 21/32"; I have no idea why and don't care for the "Beretta Look" it gives No. 1, but it works fine so I've left it. It is also a 1-piece bbl. Subsequent Barsto bbl's are two-piece similar to factory ones. I've noticed no difference in performance with either type. Today, I shot at 7, 15, and 25 yards. This group was fired using Rainier 124-gr. PRN bullets loaded over 6.9-gr. Blue Dot and ignited in Winchester cases with a Federal small pistol primer. Average velocity is around 1160 ft/sec. These are the older flat base bullets rather than the improved concave based ones sold today. One MUST use slower powders with these in 9mm or the edges of the base "blow off" and accuracy goes downhill quickly. With cast bullets and these plated ones, I get better groups with the Barsto bbl. With jacketed bullets, the factory bbl, if properly fitted, groups better than I can hold. This group was fired from a seated position and I used two-hands with my wrists braced on sandbags. Using Winchester USA 115-gr. JHP, I repeated the same thing. For me, results were about what I expected and satisfactory. This standard pressure loads kicks out the 115-gr. JHP's at around 1160 ft/sec. 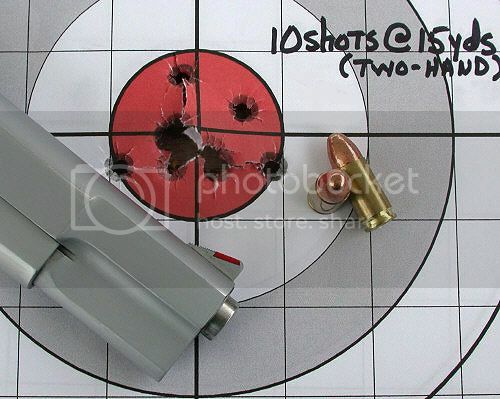 Feeling pretty good today, I shot a 15-yd group standing and in slow-fire using a two-hand hold. Ammunition was the Rainier handload previously mentioned. I was very pleased and somewhat surprised with the group. I simply cannot visually define the front sight as I could 25 years ago. 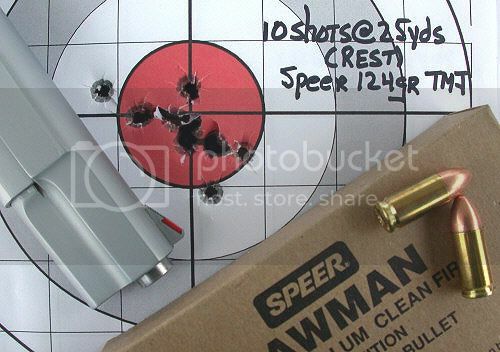 Again seated, using a 2-hand hold and with wrists braced, I shot one 25-yd group using some remaining Speer Lawman 124-gr. TMJ ammo I bought about 12 years ago. It was accurate then and seems to have held its ginger fine. It usually runs between 1140 and 1150 ft/sec for me out of the Hi Power. I drew my usual "Gort" target and moved to 7 yards. I was fortunate in that a fellow shooter had a PACT timer and I could not have to estimate times. 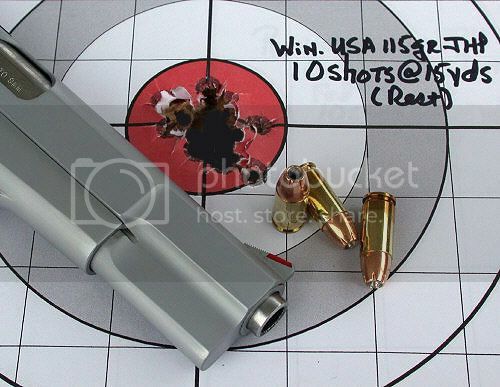 Shooting was again done with Winchester USA 115-gr. JHP. Starting from a low-ready with the gun on safe, the head shot times averaged .76 seconds each. In the chest area, there are two shots higher than the general "group." Each of these is the second round fired in two sets of "hammers." For me, the "hammer" is defined as one sight picture with two shots fired while letting muscle memory "guide" the second round. From a low-ready, average time to the first shot was .44 seconds with the second round being fired .19 seconds later on average. The rest of the chest shots were made using "controlled pairs." For me this is one flash sight picture for each shot. From a low-ready, the first shot was fired on average .48 sec after the buzzer went. Average time for the second shot was .31 sec later. I don't know that it proves anything, but it was fun...which is always something I'm on the lookout for. If I had it to do over, I would NOT have had the front of No. 1's trigger guard checkered. It does me no good whatsoever, though I thought that it might way back in the early '70's. I am not a fan of "light colored" guns, but I have to say that this old hard chrome job by Armalloy of Ft. Worth, TX has held up just fine. Other than spring replacements, this Hi Power is running on its original parts and the original stocks are still on it, though I have refinished them a time or two over the decades. This pistol has punched lots of paper and killed many critters both "great and small." Well, the "greatest" has been 3 Texas whitetails cleanly taken at close range with a Sierra 115-gr. JHP loaded to about 1270 ft/sec. It popped a couple of rattlesnakes that simply were too close for comfort and untold numbers of water moccasins. I shot many a bullfrog with it one night; enough to feed several relatives the next day and it "taught" one would-be burglar that there are some homes best left alone. Where some suggest that its design is dated, I sort of think "proven" and if it is cursed with a "slow reset" (relative to the great 1911), it's plenty fast enough for me. If it is "obsolete" compared to some newer 9mm pistols, I can only say that "obsolesence" doesn't keep it from doing its job, putting holes where they need to go. I know that it's supposed to be a "tool" but I cannot help having a special irrational emotional attachment to this Hi Power and it was great fun just letting it "do its thing" today. This old gun will be with me to the end and I hope to leave it to a member of my extended family who's like a son. The gun does have a near identical twin, but it lives in Colorado now when my best bud for decades moved up there after retiring from police work. Had just a peach of time with this old gun. It was one that I learned on and one that I had when handgunning was always exciting. What I'd give to have that thrill again. I guess like so many others I've become a little jaded, but shooting this old thing always brings back memories of days far gone, times spent with friends (some of whom have passed on) and just the pure excitement of youth. Here you can see the checkered trigger guard, a modification that I feel was a mistake on my part. This pistol has been with me when I thought I'd surely freeze to death as well as times when I don't think that Hell could have been hotter! It's been rained on and covered with grit on several instances, but it has always been cleaned and maintained as soon as was possible. It will be cleaned thoroughly today before being put away in the safe. I hope that each of you find or already have a "special" handgun or rifle, one that makes you not think of it with strict logic but that inspires an emotional attachment. It is a good thing, I think. Whether it is or it isn't, I have it with this old thing and make no apologies. That is such a beautiful pistol, Mr. Camp. A Hi-Power is next on my list. 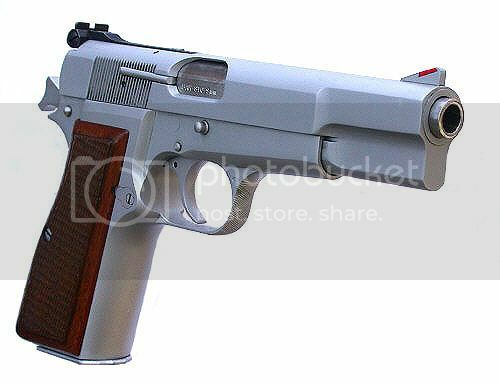 That is a beautiful pistol. I too, have a first Hi Power. I bought it 41 years ago and have it still. Unlike you, I have used it very little. I'm an amateur who has recently started shooting again. I have bought a 1911 recently because some of my friends shoot them. I like 'em, but my heart remains with the Hi Power. It's nice that we develop affection for inanimate things like guns. We lavish them with care and attention and emotion. I think it speaks to recognition of the genius of John Browning and those who build our guns, as well as those who fix and modify them. It's an appreciation of the humanity involved in the process. We enjoy the beauty of the steel and wood and the fine hand of man in shaping them. BTW, your books arrived a few days ago and I really like them. Beautiful pistol, Mr. Camp. I don't think I've ever fired a Hi-Power, but I do like the way they look--and I certainly like the way yours performs. My problem is that I have small hands and short fingers and most autoloaders with double-column magazines are just too big for me. I've tried Berettas, Glocks, Springfield XDs, etc., etc., and they're all too big. My current autoloader, used for CCW, is a Kahr PM9. The grip is just the right size. So, I guess when I go for a full-sized semi-auto, it will be another Kahr. Hello, sir, and thank you. While the Hi Power is a double-stack, it is relatively "petite" compared to some. Still, for folks with smaller hands or who simply do not find it comfortable, there are lots of other good choices and I think that going with what works for you is the best bet. Very nice. I too love the Hi Power, but I do not love the damage it does to your hand (Web between thumb and first finger) every time you shoot it! I have see a few custom ones with a beavertail, but the price of those are too high for an off the shelf purchase. If Hi Power makers would offer a beavertail model with a combat hammer I bet they would sell a bunch more than they do now. I know of one more anyway.....ME! AEA wrote: Very nice. I too love the Hi Power, but I do not love the damage it does to your hand (Web between thumb and first finger) every time you shoot it! I've heard from other Hi-Power shooters that a commander hammer is a good solution for hammer bite, and the only people I've heard complain had spur hammers. I'd advise trying a commander hammer model out if you're able, and see how it shoots for you before discounting it. I'll give that a try...thanks! 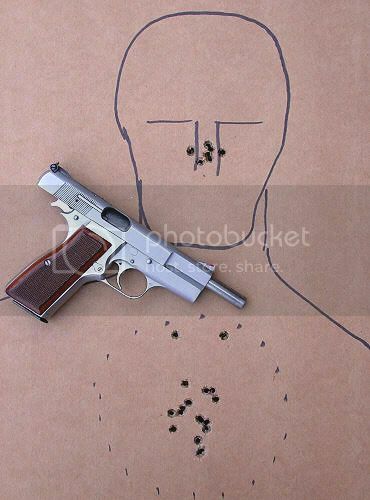 I have never fired a Hi-power before either but have heard they are quality weapons without paying through the nose. Is the CZ75 is a very similar pistol in design? 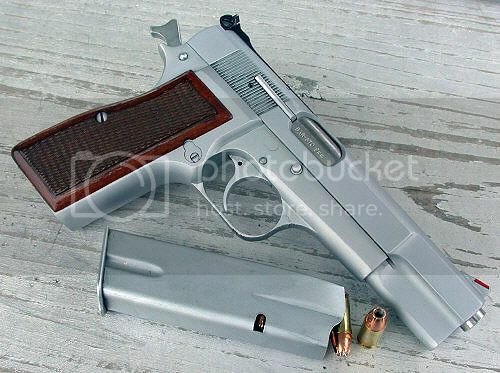 I am interested in a full size 9mm and liked the look and feel of the CZ, other than the Hi-Power can you suggest another weapon similar to this? Hello. The CZ and Hi Power differ internally in about every way. Both are nice shooters in my opinion and the CZ, which normally costs less than the Hi Power (at least for the basic models) seems to be both popular and reliable. My CZ's are Pre-B models that I've been quite happy with. Were I not able to have the Hi Power (personal preference on my part), the CZ would almost certainly be my second choice.